All eyes were focused on Kevin Rudd as he gave his last press conference as prime minister. We saw him try to crack hardy with a little laugh, the false laughter that comes from a heart that only wants to scream and rage against the world. We saw him cry. The tears were genuine but inscrutable. Was he crying in self-pity, or was it rage? Was it disappointment or just the whole horror of the moment; as unspeakable as it is incomprehensible? As I watched the downfall of a man with whom I had battled day after day, I could feel the cruel emptiness engulfing him. Was he unjustly treated? Well, I don't think the former Labor leader Kim Beazley would think so. Politicians live and die by the sword. But all of them, all of us, are human beings and those who pretend these disasters leave them unperturbed are doing just that, pretending. Rudd will be going through the darkest, blackest days of his life. After he failed to win the seat of Griffith in 1996 he wrote a monograph called When the phone doesn't ring. I am not sure how often the phone rang for an ALP candidate for Griffith in 1996, but it never stops ringing for a prime minister. I cannot think of any prime minister who has fallen so far so fast. John Howard had a year to contemplate his likely defeat and was toughened by the scars of many setbacks and disappointments. Bob Hawke could see Paul Keating's shadow looming over him for years. But Rudd's downfall came like the thunderclap in a summer's storm - one minute he was the master of all he surveyed, packing his bags to hang out with Barack Obama at the G20, and then the assassins struck and he was gone. Gus: ah... 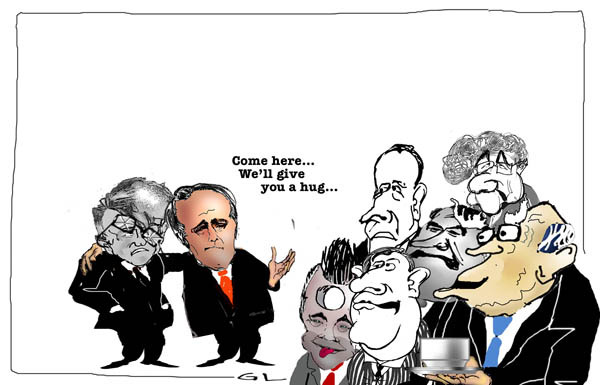 If only politics was about giving hugs... the world would be a much better place... But the human world, including politics, is a corner of stylistic fist-fights where we make untold promises and bitsy actions with resultant as accidental mistakes or partial successes — the lot being misunderstood or understood by others, via filters of perception and delusion, rarely through the reality as it could be. The net result is a shifty blancmange in which not the BEST, but the MOST often prevails. In our system of governance, it's called democracy. And there is nothing that can stop a caucus change horses either... It's still part of the democratic processes. Say, Rudd was sending more and more wrong signals to the people who "employed him", the caucus of the Labor Party, the party that we, the people of this "country", with a feeble majority, had decided should rule the roost for a while. But we had not decided enough... The unrepresentative swill was still annoying, with its feet in creationist crap. And what are we left with? The excitement of Julia Gillard, which Labor hopes will last long enough to get it to polling day, and a dark uneasy feeling Australia is not run by the people we elect, but by union heavies coldly calculating the fate of leaders around the lazy Susan of a Vietnamese restaurant. For all the time I sat opposite Rudd, I could never read him. He has a very good poker face, which I sometimes envied. His lack of warmth made him inaccessible. Perhaps that's what he intended. Gus: Julia was elected by the people. Whether she is deputy, backbencher or prime minister is only relevant to the team that we elect... I personally welcome "that" backroom deal (I proposed it about six month ago — in a way where Kevin would retire gracefully for whatever reason) — a deal that to say the least was done by the up and coming generation of leaders with vision. Rudd sure lost the way but I feel his actions were his way. His was on top and could not imagine his fall. He was kingpin. He had lost the skill to communicate hence the pissed off staff around him and the public. I agree with all you have said Gus especially that it is time for the old boomers to step down, let the young guns in, but me thinks they will rule in quite a different way than we are used to. Always thanks for your great articles. He can empathise with Kevin Rudd, but Bob Hawke says the public only ever rubber-stamps party choices, writes Peter Hartcher. IF ANYONE else knows how Kevin Rudd feels at the moment it should be Bob Hawke. Yet the only other Labor prime minister to be overthrown by his own party in the postwar era has vigorously defended the party's right to tear down the leader. "It's not pleasant to be deposed," Mr Hawke said. "But there's no question about the right of the party to change leaders," he told the Herald yesterday. "No one can speak on that subject with greater authority than myself." Mr Hawke emphatically rejected the claim made by Mr Rudd, the Opposition Leader, Tony Abbott, and others, that Mr Rudd had been elected by the Australian people. Gus: my point exactly. They are elected as a representative by the people then chosen by the parties as a leader or not... See toon at top. Actually, seeing Kevin back in Queensland on ABC news a couple of days ago gave me a bit of hope. He appeared to be RELIEVED. Cheerful, jovial and relieved... Happy chappy.... As if the burden of leadership had been lifted from his weary shoulders. Let us leave aside for the moment the Coalition's protestations. They are to be expected, and clearly confected for party political purposes. The idea that a sitting prime minister should only be removed by the electorate was largely forgotten when the Opposition was calling for Rudd's resignation over Utegate. Nor was it a principle John Howard ever cited the many times he was asked about his future as Liberal leader. He would stay as long as his party wanted him to stay, and he never argued that only a popular mandate could legitimately displace him. Even those in the Liberal Party who refused to confront Howard in the face of looming disaster never argued such a principle. Rather, as Tony Abbott has said repeatedly, they thought the party was better off with him at the helm. The Coalition does not truly grieve for Rudd's dignity, but for its once promising electoral prospects. ... the shallowness of Mr Rudd's relationships with his colleagues was a principal driver of his premature end. And the tepid response from Team Rudd to public criticism of him cannot have but confirmed the public in its waning affection. A few more muscular defenders on the inside, and Kevin Rudd could have avoided this fate. (For how long, and to what end, are other matters). Imagine how differently things might have turned out, had a well-briefed Kevin Rudd chosen to fly to the G20 on Wednesday morning, instead of leaving it until Thursday? Instead, he was in his office on Wednesday evening, ready to receive Julia Gillard's ominous visit. Prime ministers are solitary creatures. But the events of last week are a demonstration of what happens when they are too solitary. For 35 years the ALP has protested the Kerr coup, ululating over the vice-regal regime change that deposed Whitlam. The Dismissal? Factional thugs now dismiss leaders at their whim. In cowardly conspiracies. First, a rapid succession of NSW premiers. Now a Labor prime minister. For once, and only once, I’ll agree with Tony Abbott. Removing a PM from office is a job that properly belongs to the electorate. It’s what elections are for. Now the faceless men are back in the saddle and I’ve had enough. For over a month my membership renewal has been languishing on my desk. Paying to remain in the NSW branch seemed problematic. The assassination of Rudd makes a final decision all too easy. After 50 years of membership, through thick and thin – mainly thin – I’m resigning. Dear Phillip. many "man in the street" also think you are arrogant and condescending. I often argue against this glib labelling, that this could be the privilege of knowing to much. But then again, the men in the street remind me we never know all. Australia has one of the most brutal political cultures in the democratic world, in which party leaders are dispatched with abandon. As yet another prime minster [sic] faces a threat from her own side, has the country become the "coup capital" of the world? Not yet three months old, 2013 is already shaping up as one of Australian politics' more casualty-strewn years. The wounded and slain include the chief minister of the Northern Territory, who suffered the humiliation of learning that he had been deposed as leader by telephone while on a trade mission to Japan. Elected last year, in a victory that brought 11 years of Australian Labor Party (ALP) rule to an end, Terry Mills had spent just over six months in the job. The Premier of Victoria, Ted Baillieu, survived longer - just over two years - but decided earlier this month to resign as leader before being pushed as scandal engulfed his office. Weeks earlier, the Liberal leader in South Australia, Isobel Redmond, who once famously volunteered to be tasered by police, also became the victim of a party room mutiny. At the state and territory level, three party leaders have gone in as many months. Canberra, the nation's capital, offers no refuge from the bloodletting. If anything, it is even more vicious. The Prime Minister Julia Gillard, who only last year survived a leadership challenge, has been battling for weeks to fend off another "spill," as these party room votes are popularly known. In 2010, she herself was the beneficiary of a coup, knifing her one-time boss, Kevin Rudd, less than 1000 days into his first term in office. Four years earlier, Ms Gillard had also played the decisive role in helping Rudd oust his predecessor, the gaffe-prone Kim Beazley. In the past decade alone, the ALP has had five different national leaders. On the conservative side of politics, the Liberal Party has seen an even higher attrition rate. It has had four different leaders in the past six years - its once-dominant prime minister, John Howard, the short-lived Brendan Nelson, the hugely ambitious Malcolm Turnbull and the present incumbent, Tony Abbott. Whether in government or opposition, party leaders have about as much job security as managers of Chelsea. Canberra, then, is in danger of becoming the coup capital of the democratic world. Arguably, it is already. Something of greater import to Australia's ageing population did happen, however. Age pensioners across the land were getting a particularly handy increase in their fortnightly incomes. From Wednesday, single pensioners will garner an extra $35.80 per fortnight, and couples will get an extra $54. These increases, adding the scheduled half-yearly increment of $22.30 to the new carbon energy supplement of $13.50, will take the total fortnightly pension for singles to $808.40. There was a time when such cheering news - a pension increase of somewhere around 4.5 per cent, well above inflation - might have shouted its way through newspapers across the land. Elections have been won and lost on arguments about the age pension. Treasurer Wayne Swan hailed the achievement during question time, but you may not have noticed. May Julia Gillard be kept as leader of the Labor Party. Tens of thousands of babies of unmarried, mostly teenage mothers, were thought to have been taken by the state and given to childless married couples. Many women said they were coerced into signing away their children. Speaking in front of hundreds of the victims, Ms Gillard said the "shameful" policy had created "a legacy of pain". "Today, this Parliament, on behalf of the Australian people, takes responsibility and apologises for the policies and practices that forced the separation of mothers from their babies which created a lifelong legacy of pain and suffering," she said at Parliament House in the capital Canberra. "We deplore the shameful practices that denied you, the mothers, your fundamental rights and responsibilities to love and care for your children." But the really fascinating thing is that inside this Number Three column was actually a Number One just bursting to get out. Latham's private story is a great one about the triumph of love. A man whose commitment to and enjoyment of his children is bigger than anything else in his life, he could be a passionate and fearless buster of the club mentality that still dissuades men from changing the way they work when they have children. For men, the unwritten expectation that being a good father to one's children necessarily involves being absent from them is far more oppressive than whatever stridencies an inner-city feminist might occasionally commit to the page. But the tragedy is that this inspiring story somehow can't be told without the bloody exordium of a punch in the face for someone else. Latham closes his column with a slap at Pryor for being "cowardly: popping pills as an easy way out". But addiction to a format can be cowardly too. And it's pretty sad when the substance you can't kick is bile. Long live bile! Long LIVE BILE! as long as the points are sharp and correct. The Bolts and Jones bilers are always wrong.